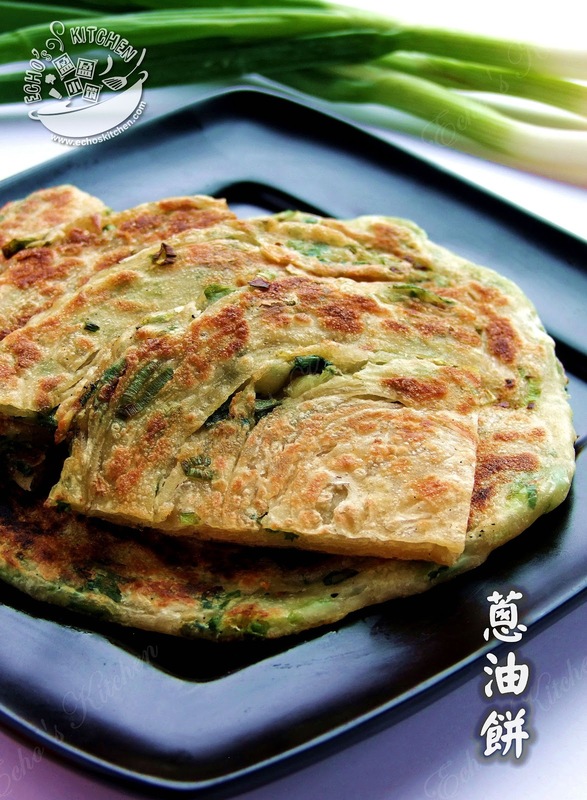 This Spring onion pancake was my sister in law Wen Wen's favourite when she used to live in Taiwan. She asked for a good recipe from me, with those spring onions growing like crazy in my garden, I immediately took the task at hand! Note: This is a revisit and fine tuned version of the original recipe posted on 5/11/2011. 1. First, take out 1/3 cup/45 gm of all purpose flour from the total flour listed. 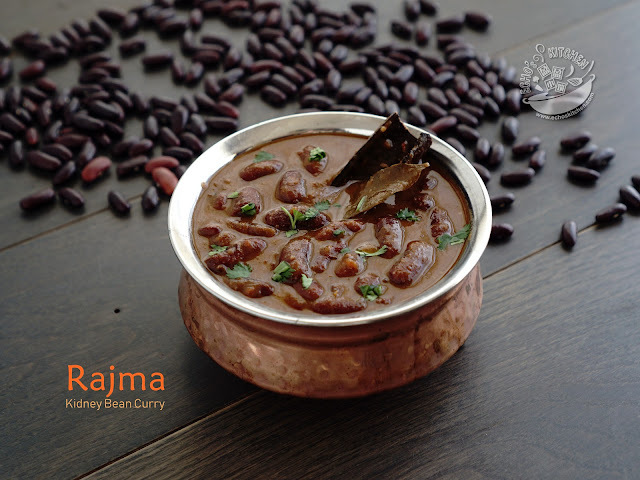 Mix it with 1/3 cup/50 ml of vegetable oil and 1 1/2 tsp of salt, it should form a runny paste. 2. Knead the remaining flour with warm water until the flour becomes flaky, add room temperature water to form a very soft ball, it should feel like your earlobe when touch. Leave the dough aside for 10-15 minutes, cover with a wet towel or cling paper. 3. Washed and drained spring onion/scallion, spin dry and chopped as fine as possible. Note: it is important to spin the water out of spring onion, to prevent breakage during rolling later. 4. Spread some vegetable oil on working surface and on hands. Divide dough into 4 equal parts (around 150 gm each) or 6 equal parts (around 100 gm each) , roll it out into a rectangular shape, around 1 mm thick. 5. 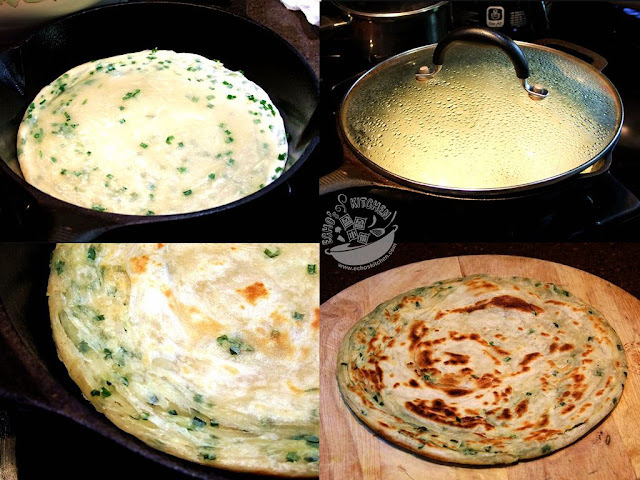 Spread a thin layer of oil-flour mixture (around 1 tbsp) on it and sprinkle as much chopped spring onion as you can handle. 6. Carefully roll the sheet starting from the top, once it is all rolled up like a rolled towel, with firm grips at both ends, slowly pull and fling the roll at opposite direction while lightly tapped the dough, this is to pull the dough into a long strip, the longer, the better. 7. Rolled the strip up to shape like a spiral shell, tucked the end underneath. (As shown in the picture.) Leave the spiral shells to rest for another 20-30 minutes. Note：You can make these doughs in bulk, it stays well in the fridge for 2-3 days and up to a month in the freezer, just defrost/thaw the dough one night before you want to fry it. 8. 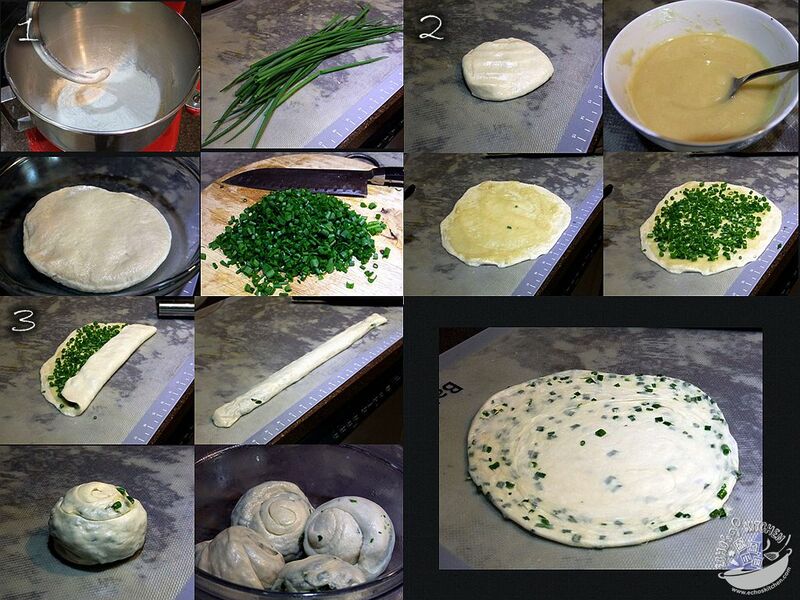 After half an hour, take out one of the dough and roll it out into a 6/8 inch flat bread. 9. Heat up a cast iron pan/griddle, fry pancake at medium heat, cover with lid first, when the surface of pancake turn translucent, turn and fry the other side. You can use some oil for frying if you like your pancake to be crispier. 10. Cook the pancake the way shown in the short movie below to loosen up the layers, this will make it crispy, layered and soft. A cool breakfast to go with a cuppa hot soy milk! I just visited yours.. and its fabulous!! Will surely visiting again soon! "First weigh 60 gms of all purpose flour from the 450 gms, and mix it with 1/3 cup of vegetable oil, add 1 tsp of salt into the oil-flour mixture, set aside." So what do you do with this dough? Exactly my question as well. Is there any answer to this? See this.. Spread a thin layer of oil-flour mixture evenly, sprinkle chopped spring onion as much as you can handle. at next step, you spread it over the flattened dough to create layers. hi Aki... should try this out!! it is very tasty! I like this spring onion pancake. I would like to try this recipe. Pls kindly advise 1 cup warm water is equal to how many millilitre(ml)? For the warm and room temperature water, which one to be added first to the remaining flour? Thank you. 1 cup is about 235 ml of water.. approximately. you can add the water together! Hi I just found your blog and the food is amazing! I'm just having some problems with the first step, when I add all the water to the remaining flour my dough becomes really watery and I'm not sure if it's meant to be like that? Would love to get this right since it looks so yummy so any advice would be great! it is not meant to be watery, how many gms of flour are you using? In Singapore this chicken chop is everywhere and over here it is invented by Hainanese people. Many Hainanese took up the job of chef and worked for many British during the colonial times so they picked up western recipes and came up with their own. They opened many western restaurants and food stalls serving unique Hainanese style western food in Singapore. 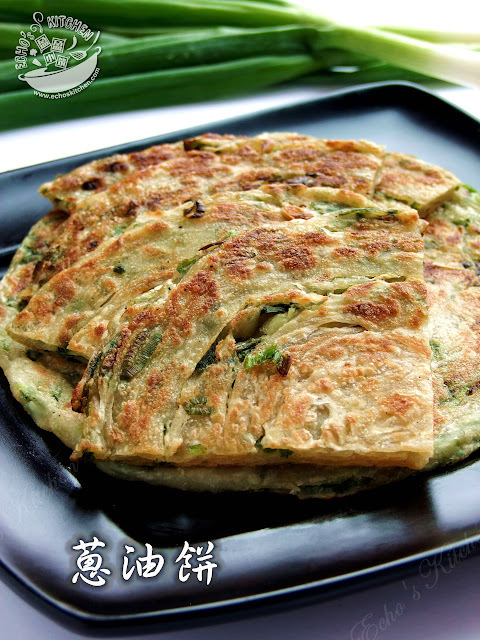 You can google Hainanese western food and I am sure you can find a lot of Singapore pages. This chicken chop is a well known Hainanese thing as far as Singapore is concerned. In Sg Malays are a minority, they are pretty much left by themselves, the Chinese eat everything. Only a small portion of the Buddhists do not eat beef but many do. Hock Lam Beef Noodles is Teochew style and is a Lao Zi Hao for over 100 years. There is also Hainanese style beef noodles which uses thick savory gravy instead of the soup version of the Teochews. the beef noodles recipes are brought over from Chaoshan, China. Stir fried beef with spring onion is a common dish too. woww.. thanks for letting me know! I shall visit the beef noodle stall when I visit singapore next time.